I have good news! It’s been awhile since I’ve shared any recipes here. In part, work has been crazy and must take a higher priority. Also, my oven is still (yes, still!) broken. But, I want to get more into creating new recipes. I’ve started jotting new fall recipe ideas down in my recipe journal, and I have THREE recipes ready to share with you. 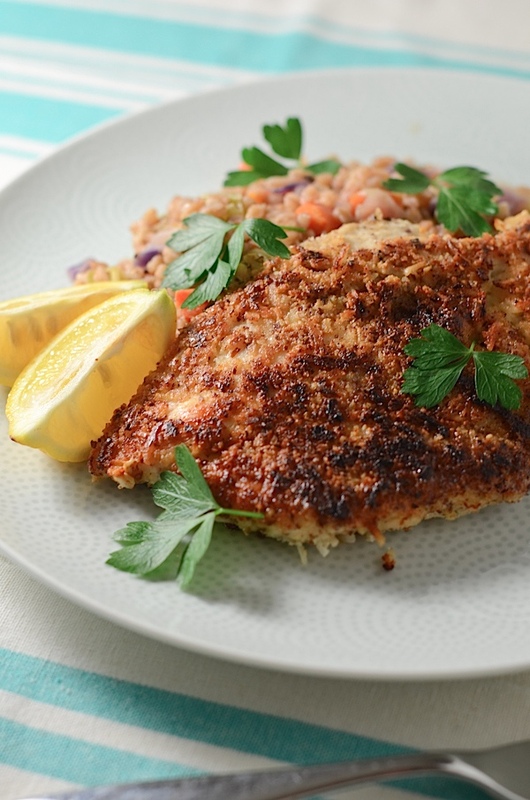 First up – this Coconut Almond Chicken Recipe. 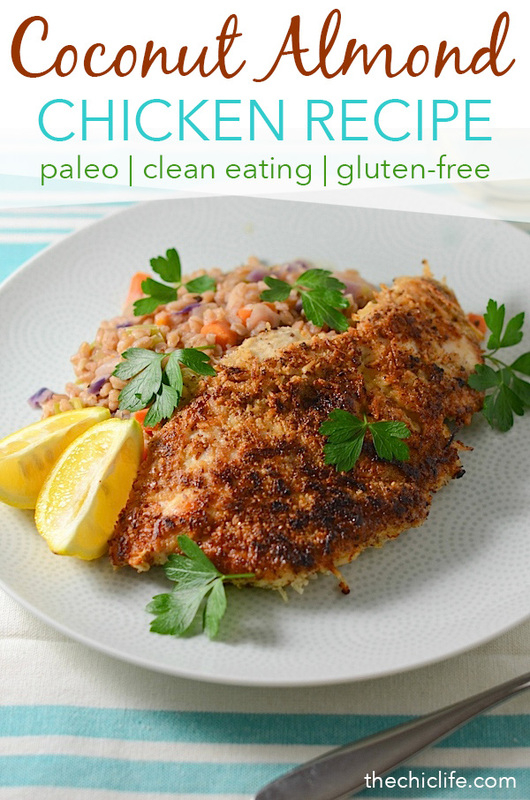 I’m not following the paleo nor gluten-free diet, but I did want to call out that this recipe would be great for either for my friends who do. As usual, it is a clean eating recipe. Woop! Without further adieu, here’s my latest and greatest Coconut Almond Chicken recipe (scroll to the end). I was inspired to make this when I was shopping at Trader Joe’s recently. I went by the section where they have the bags of nuts, and I saw almond meal and coconut flakes right near each other. They both sparked ideas for multiple recipes, so I thought I’d pick up a bag of each to do some testing. The results for both were great! Since my oven is still broken, I decided to sauté the chicken, but you could also bake it, and you could skip the oil that way. 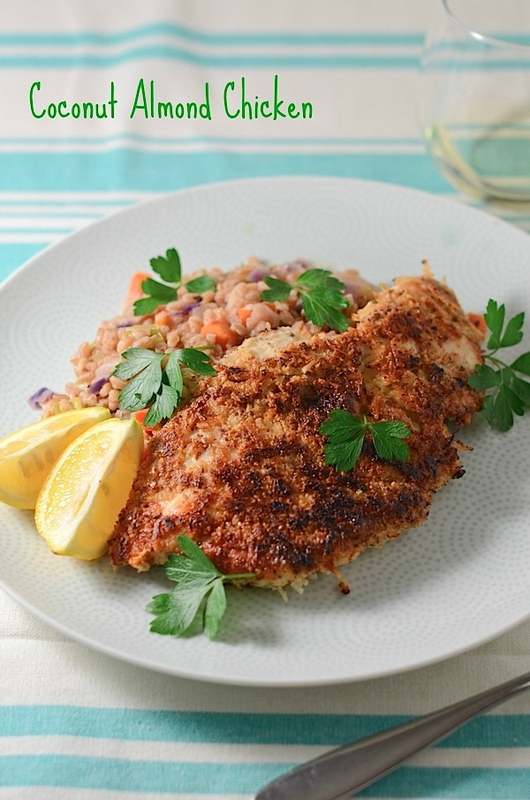 I’d probably prepare it in a similar way to my Crispy Oven-Friend Almond Chicken Recipe. The almond meal or coconut could probably be used individually as a breading, but I liked the two of them mixed together. The coconut gave the breading a more unique texture while the almond meal helped it stay nice and crunchy and also filled in the gaps where the coconut flakes may have left some space. I also ended up squeezing a little lemon juice on the chicken for a little extra zesty flavor. But, the lemon wedges also look nice on the side of the plate in case you want to make the serving a little more visually appealing. 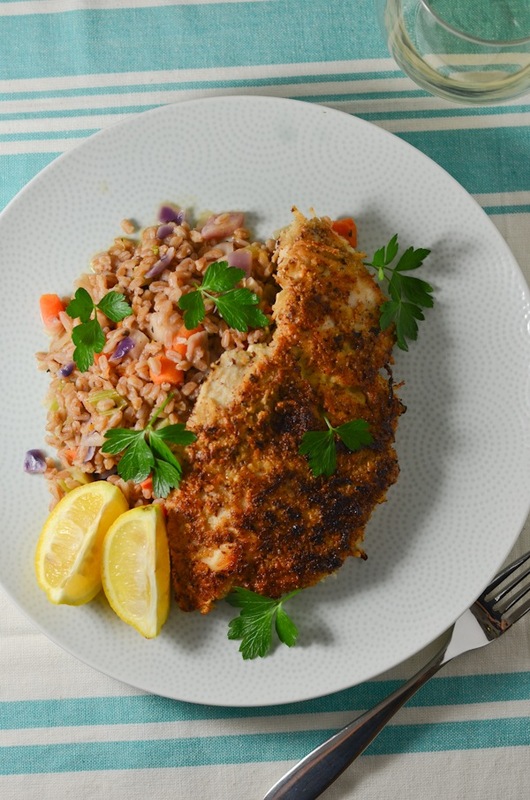 This easy dinner would be great for any weeknight or even weekend. 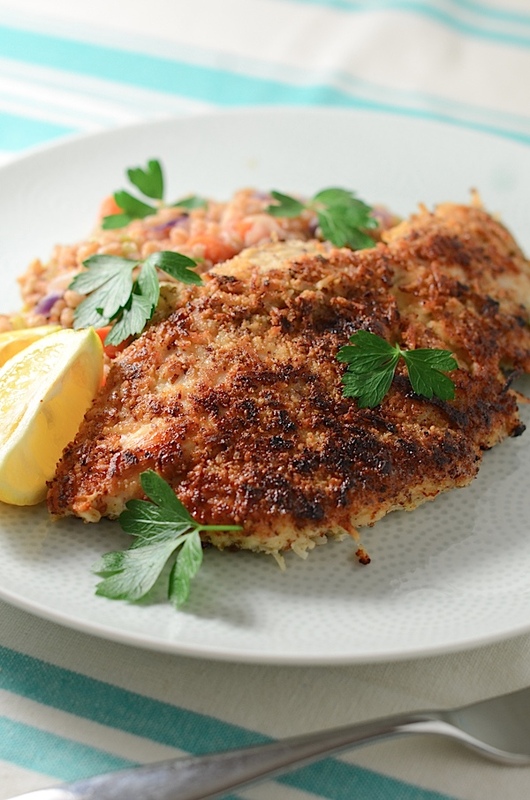 It comes together quickly, and the variety of breading ingredients gives it a fun texture. Lemons are optional, but they add fresh flavor and are also pretty as garnish. I used Trader Joe’s almond meal and organic coconut flakes. Pre-heat a large, non-stick pan over medium heat. Add oil. In one large, flat bowl, stir together almond meal, coconut flakes, garlic powder, salt, and pepper. In another large, flat bowl, lightly whisk one egg. Dip both sides of the chicken into the egg. Then, dip both sides of the chicken into the breading mixture to evenly coat both sides. Sauté chicken on both sides until chicken is cooked through, about 5 minutes per side. 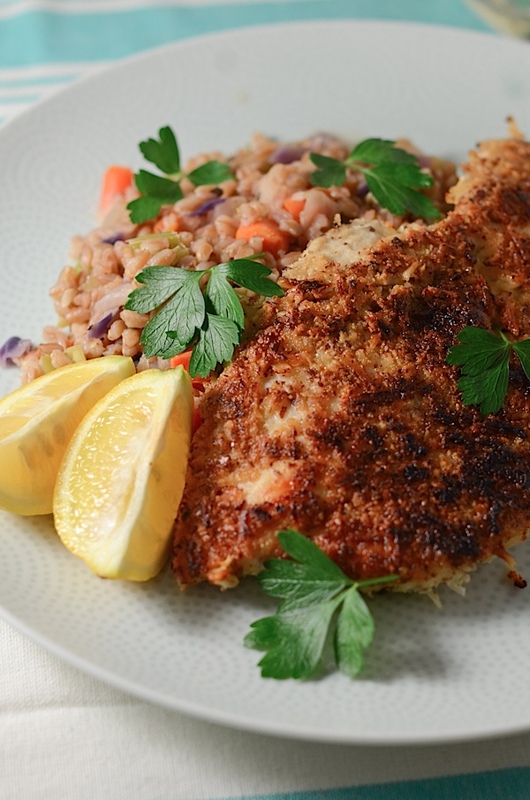 Serve with fresh lemon wedges. Garnish with chopped parsley. Note: Be sure to check the packaging of the ingredients to ensure the products are truly gluten-free. Some ingredients are naturally GF but are produced on equipment with other ingredients that do contain gluten. Did you know tomorrow is the first day of Autumn? I’ll have a new fall-themed recipe up for you tomorrow. It’s for an easy and healthy dessert. Get your dehydrators (or ovens) ready and check back tomorrow! Hint: the recipe uses both the almond meal and coconut flakes leftover from this one, so you can make both in the same day or week. I love being efficient. Also, I’m brainstorming post and video ideas for a Parisian Wardrobe update. Let me know if you have any specific requests. And finally, I may not always have as much time to blog as I’d like, but I have been staying pretty up-to-date on Instagram, Snapchat, and Periscope. Be sure to follow me on those channels because I post different things on each. I shared a quick video of Bailey playing on the beach on Periscope that was really fun! My user name is @thechiclife on pretty much everything but Snapchat and YouTube where it’s thechiclifeblog. Thanks for stopping by. Hope you enjoy this Coconut Almond Chicken Recipe! I’m trying to get off wheat and sugar, so I’ve been lokonig for a starter recipe using almond flour, this one turned out pretty well, despite a lot of substitutions I used half chickpea flour, I added cocoa instead of chocolate chips, subbed earth balance for the fat and sweetened with a little coconut sugar and stevia. Still pretty delicious, so thanks great recipe, really simple and flexible!